This barrel holds a blend of organic wastes – leaves, food wastes and manure – to start the process of composting. Composting is a natural process that results from the controlled biological decomposition of organic materials such as leaves and grass clipping and food scraps. It's produced by the help of aerobic microorganisms. Those little critters need oxygen, heat and water to to grow and multiply. The organisms create heat, water vapor and carbon dioxide as they break down the organic material into compost. The first part of the process works at a higher temperature with a faster rate of decomposition. 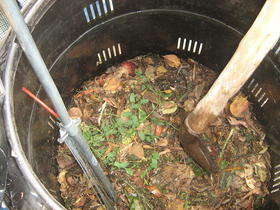 The later part of the process is cooler and stabilizes the final compost product.